The University of Barcelona (Officially in Catalan: Universitat de Barcelona, UB; in Spanish: Universidad de Barcelona) is a public university located in the city of Barcelona, Catalonia in Spain. It is a member of the Coimbra Group and Joan Lluís Vives Institute. With its close historical ties to Barcelona and to Catalonia, the University of Barcelona recently celebrated 555 years of its own history and the academic service to the community that has made it Catalonia’s most important public university. In all Catalonia, the UB is the university that caters to the greatest number of students and offers the broadest and most comprehensive series of higher education qualifications in its first- and second-cycle degrees and the widest range of UB-endorsed programs and studies in postgraduate degrees , master’s programs and doctorates. The University is also the principle academic institution promoting university research at a national level in Spain and has become one of the finest research institutions in Europe, in terms of both the number and quality of its research programs. By virtue of its importance as an academic institution, the University of Barcelona has also made a decisive contribution to the democratization of knowledge for many generations of citizens in Catalonia and the rest of Spain. Our campuses play host to a large number of students from around the world who have chosen to complete their studies at the UB at a time in history when learning has become one of the most trans-national of all activities. And finally, we are proud to be able to say that the UB’s numerous alumni constitute a broad crossection of Catalan society today. 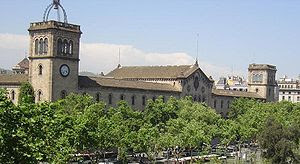 The process that would culminate in the foundation of the Estudi General of Barcelona can be traced back to the end of the fourteenth century with the opening of a number of schools under the patronage of the City Hall, the Cathedral Schools and the Dominican convent of Santa Caterina, which established itself as a major cultural centre. Although Jaume II founded the first university centre of the Crown of Aragon, in the year 1300 in Lleida, it was King Martí the Humane who started the foundation proper of what would eventually become the University of Barcelona. Despite the Consell de Cent’s refusal to accept the concession issued by the King to found an estudi general, on 10 January 1401, Martí the Humane founded the Estudi General of Medicine in Barcelona under his royal prerogative, granting it the same privileges as those enjoyed by the University of Montpellier. In another document, signed in Valencia on 9 May 1402, King Martí sought to promote the Estudi General of Medicine with the appointment of a number of teachers of the liberal arts, without which the study of medicine was virtually useless. From that day forth, the Estudi was known as the Estudi of Medicine and the Arts. The prerogative granted by King Alphonse the Magnanimous in 1450, authorizing the Consell de Cent to found a university in Barcelona, was the culmination of the process initiated in 1398. For a number of reasons, in particular the civil war that raged during the reign of Joan II and the subsequent conflicts involving the peasant farmers, the official Estudi General of Barcelona did not begin to develop until the reign of Fernando the Catholic; but it was under Carlos I, in 1536, that the foundation stone was laid for the new university building at the top end of the Rambla. From that moment on the university began to carry out its work as normal despite financial difficulties and in-fighting between university teachers, though this was not to stop some illustrious professors from making their mark in their respective fields and creating their own schools of academic followers. The 1596 Ordinances once more showed the need for reform. These followed hard on the heels of earlier ordinances passed in 1539 and 1559, in which the competitive examination system for the appointment of professors had been introduced. This period was brought to a close with the Decree issued on 23 October 1714 by the Royal High Commission for Justice and Government of Catalonia - created by the Duke of Berwick - ordering the immediate transfer of the Faculties of Philosophy, Law and Canon Law to Cervera. Barcelona was to keep its Faculty of Medicine and the Cordelles School of Humanities, governed by the Jesuits. Plans to open the University of Cervera did not get underway until 1715 and it did not start its academic work until 1717, as the successor to the six Catalan universities closed down by Felipe V. The first statutes of the new University of Cervera were passed in 1725. The university was restored to Barcelona during the liberal revolution. In 1837, the University of Cervera was transferred to Barcelona, the capital of the principality. From that moment forth it was recognized as the cultural home of the four Catalan provinces. The University’s first official home was the former premises of the Convent of Carme, which served temporarily to house the Faculties of Theology, Canon Law and Law. The Faculty of Medicine was housed in the Royal Academy of Medicine next to the Hospital of Santa Creu and Sant Pau, and the streets known today as carrer Hospital and carrer del Carme therefore provided a home for all the University’s faculties. The inadequate nature of these premises soon gave rise to the need to construct a larger home for the University and in the 1860s, work began on Elies Rogent’s splendid new building, though it would not be fully completed until 1882. Rogent’s Historic Building, which houses the University today, was begun in 1863. Its construction was to have major repercussions for the city, since it was one of the first buildings to be raised outside the ancient city walls. Work on the building lasted for more than twenty years, although by 1871 the first lectures were being given there. The clock and the iron bell housed in the tower in the Pati de Lletres - the Arts Court - were installed in 1881. Parallel to the building work, sculptures and paintings were commissioned either directly from artists of repute or awarded in open competition. The architectural work and the quality of the building’s works of art meant that it was declared a national monument of historic and artistic interest in 1970. On its completion, all the university courses could now be taught in the same building, a construction that brought prestige to the city and satisfied what had been an essential need. Medical sciences continued to be taught at the former Hospital of Santa Creu i Sant Pau. 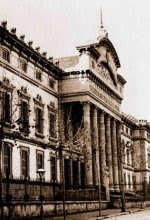 In 1879 the Faculty of Medicine was presented with a project for a new hospital, and after many changes in the plans and suggested locations, it was eventually installed in the Hospital Clínic on the eastern side of the city’s Eixample district in 1900. Today, Medicine is also taught on the Bellvitge Campus and at the Hospital of Sant Joan de Déu. The natural growth of the University of Barcelona has given rise to the need to undertake large-scale building work to meet the growing demands made by student numbers that were unthinkable in the nineteenth century. In response to this growth, the university district of Pedralbes was begun in 1952. The first building to be completed on this new city campus was the Faculty of Pharmacy in 1956 alongside the Sant Raimond de Penyafort and the Verge de Montserrat Halls of Residence. This was followed by the Faculty of Law in 1958, the University School of Business Studies in 1961, and the Faculty of Economics between 1957 and 1968. Today this district is known as the Pedralbes Campus, while in the nineties the university added the Vall d’Hebron Campus, housed in some of the buildings in Llars Mundet. The University of Barcelona was the only university in Catalonia and the Balaeric Islands until the founding of the Autonomous University of Catalonia, in 1968, which marked the beginning of a period of division and development in Catalan university centres and institutions that would last until present times. Indeed, as recently as 1971, university institutions were still developing with the founding of the Technical University of Catalonia, which took charge of the university community’s more technically-orientated faculties and schools. And at the present time, the Faculties of History and Geography and of Philosophy have opened in new premises on a site opposite the former Work House in Barcelona’s Medieval Raval district and just a short walk from the Historic Building of our alma mater. As of 2005, comprises 100 departments grouped in 18 faculties and two university schools, one school and 8 attached schools. The UB offers 75 undergraduate programs, 353 graduate programs and 96 doctorate programs to over 63,700 students. It also has 30 research centers. It is considered to be one of the best universities in Spain.